Le Marche or the Marches (in English) is one of the twenty regions of Italy. It is located in Central Italy and borders Tuscany and Umbria, Lazio, Amelia Romagnia, and Abruzzo. Le Marche is a highly developed region with modern networks of high speed trains and regular flights making it a hot holiday destination. Even though this region is sandwiched between the high Appenine mountain peaks and the Adriatic Sea and is highly exposed to mass tourism, its historical assets remain unspoiled. In ancient times, Le Marche was a Picenum territory. Its coastal regions were inhabited by Senones. When the Romans conquered it in 295 BC it remained connected to the center of authority in Rome. The fall of the Roman Empire gave way to the occupation of the region by the Goths administratively making it a region under the Byzantine Exarchate of Ravenna. Following the fall of the Exarchate and the eventual administration under Charlemagne in the 18th century, and creation of the marches of Fermo, Camerino and Ancona in the 19th century, Le Marche became what it is known today. In fact, the name ‘Le Marche’ originated from the creation of the marches. 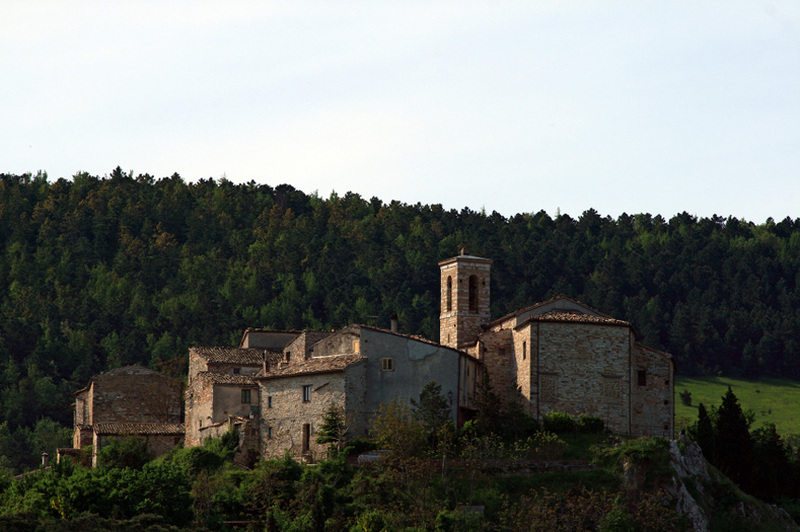 Although Le Marche was a region under the Papal States, local lords administered most regions leading to the growth of Le Marche into a free commune. From the 12th century to the Napoleonic region, the administration of Le Marche alternated from Frederick Barbarossa’s imperialism, papal authority and Renaissance rule under Gil de Albornoz. Napoleonic rule led to the unification of the Kingdom of Italy and the Roman Republic, but this unification was short lived and it broke apart with the defeat of Napoleon until the annexation of Le Marche by plebiscite to the Kingdom of Italy. Currently this region is home to many towns and each town is unique in its own sense. 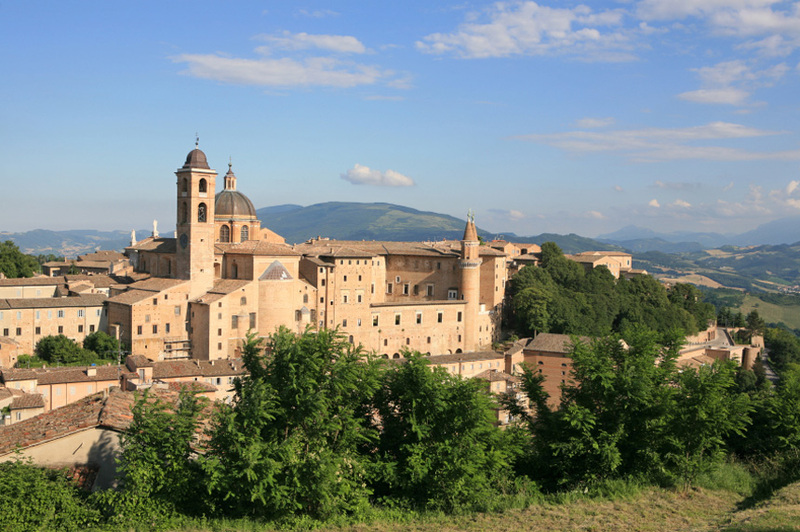 Urbino; the ultimate renaissance city, connects the adventurer to the era when the Duke Federico of Montefeltro ruled Le Marche in the 15th century. 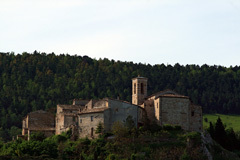 On the southern end of the region lies Ascoli Piceno which is the provincial capital. Ascoli Piceno is an old town characterized by marble paved squares and architectural masterpieces from the Roman era. The administrative capital; Ancona, is known for its beaches and busy seaport facilitating trade between Italy, Turkey, Greece and Croatia. Pesaro; a provincial capital hosts appealing seaside resorts, fishing villages and fine beaches. Even though these are the main towns, there are other smaller towns such as Camerino, Jesi, Recanati, Cingoli, Cagli, Offida, Sarnano and San Leo which offer equally thrilling opportunities and sightseeing. Alternatively, apart from what each town has to offer in terms of its culture, cuisines and museums, there are other natural marvels which draw tourists and businessmen alike to Le Marche. Some of these natural marvels can be found at Monti Sabillini where impressive mountain scenery and snow capped peaks provide a wonderful panorama, until late spring. For a perfect view of the peaks and alpine flower carpet, Monte Catria is the best choice. The Frasassi caves are spectacularly lined with limestone. Other limestone caves can be found at the Furlo Gorge which is a natural pass that has consistently proved useful since the prehistoric times. However, not the whole of Le Marche is hilly. Some regions such as Monte Conero are flat, though, these are rare exceptions to the hilly landscape which plunge into the sea to create breathtaking bathing resorts. 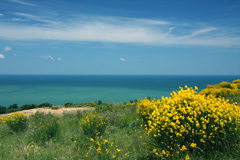 The Province of Ancona extends from the coast of the Adriatic Sea west to the Apennienes. 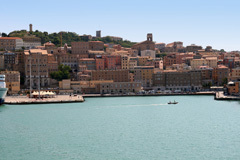 The city of Ancona is mostly known as a modern port and is one of the major jumping-off points to other locations in the eastern Mediterranean such as Venice, Trieste, The Dalmatian coast (Croatia) and the Greek isles. 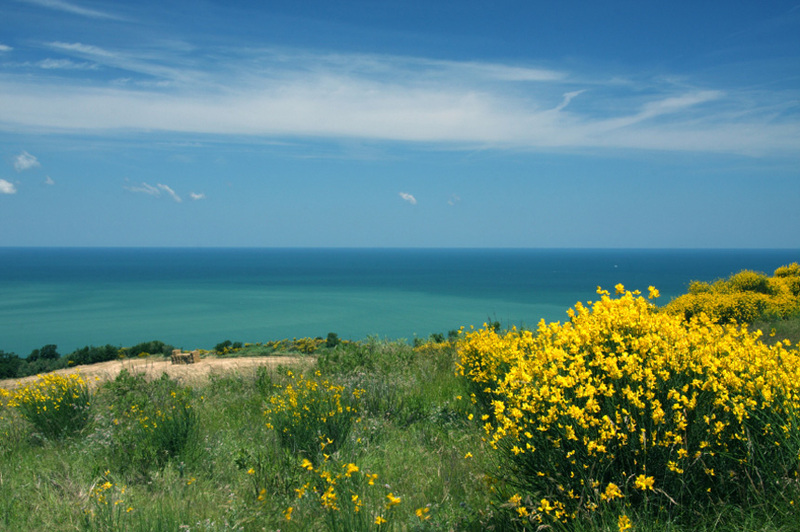 However, if you are looking for an affordable taste of a little-known part of Italy, Ancona is recommended for its unspoilt beauty, sandy beaches, and excellent cuisine (some argue it is home to some of Italy’s best seafood). The Basilica of San Ciriaco lies near the mouth of the harbor at the top of Guasco hill and has been used as a point of navigation for sailors since its completion in the 13th centruy. 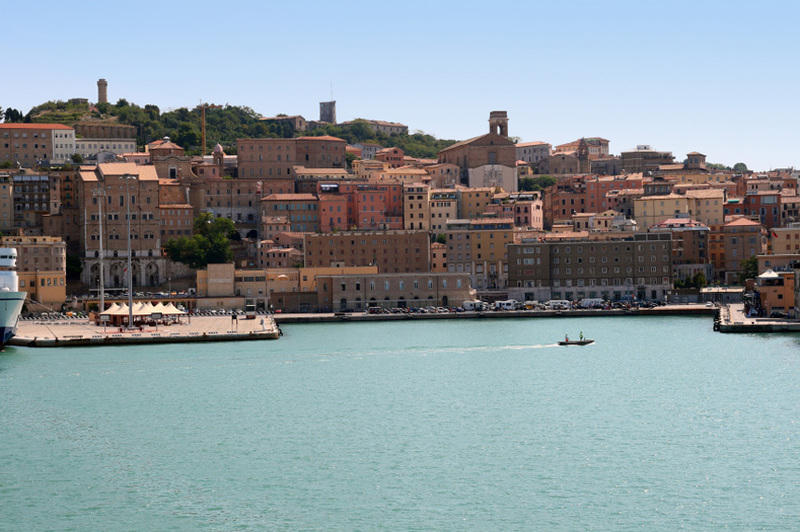 Ancona is also the home of the region’s archeological museum, the Museo Archeologico Nazionale delle Marche, with exhibits including impressive Roman bronze statues. Outside of Ancona is the regions most prominent Roman ruin, the excellently preserved Arch of Trajan. Urbino is an art lover’s destination. The city was home to one of the greatest art patrons of the Renaissance time, Federico da Montelfeltro, Duke of Urbino, thus the city is blessed with many artistic gifts of the time. The Palazzo Ducale is the centerpiece of the old city center and is now recognized as a UNESCO World Heritage Site. The Palazzo dominates the city skyline, with its twin towers being recognized throughout Italy as the home of the real Renaissance man. Urbino is also home to the Galleria Nazionale delle Marche, an ancient university (founded in 1564), and the hometown of painter Raphael Sanzio (Raffaello Santi). Other sites not to be missed are the Duomo, the church of San Giovanni Battista, the Oratory of San Giuseppe, Raphael’s birthplace where a few more masterpieces await, and the tomb of Duke Federico at the church of San Bernardino outside the city. Pesaro lies at the mouth of the Foglia River and is both a lovely seaside resort town as well as an industrial center and capital of the Italian furniture industry. It is also the hometown of the celebrated composer Gioacchino Rossini. Opera lovers will want to visit in August for the Rossini Opera Festival, where nearly every one of his operas are performed. Pesaro’s coastline along the Adriatic is home to a stretch of beautiful beaches unspoiled by foreign tourist. A popular daytrip from Pesaro is the 13th century fortress town of Gradara, the best preserved walled town in Le Marche.